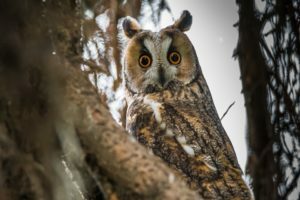 Greater Morgantown’s ecodiversity–high mountain bogs, forests of various ages, abundant farmland, and waterways–makes for great birding year round. The breeding season of April through May is the most predictable time for rewarding birding. Often, weather fronts stall migrating waterfowl in their journey from early November through March, and large numbers may be seen on ponds, rivers, and impoundments. Many common birds can be found almost anywhere in proper habitat all year long. These include: Canada Goose; Mallard; Great Blue Heron; Turkey Vulture; Red-tailed Hawk; American Kestrel; Rock Pigeon; Mourning Dove; Barred, Eastern-Screech and Great Horned Owls; Belted Kingfisher; Red-bellied, Downy, Hairy, and Pileated Woodpeckers; Northern Flicker; Blue Jay; American Crow; Common Raven; Carolina and Black-capped Chickadees; Tufted Titmouse; White-breasted Nuthatch; Brown Creeper; Carolina Wren; Eastern Bluebird; American Robin; Northern Mockingbird; Cedar Waxwing; European Starling; Song Sparrow; Northern Cardinal; House Finch; American Goldfinch (Morgantown’s official City Bird); and House Sparrow. Summer birds arrive in the spring and leave in the fall, including: Green Heron, Killdeer, Ruby-throated Hummingbird, Chimney Swift, Eastern Wood-Pewee, Acadian Flycatcher, Eastern Phoebe, Eastern Kingbird, White-eyed, Blue-headed, and Red-eyed Vireos, Barn Swallow, House Wren, Wood Thrush, Gray Catbird, Brown Thrasher, Yellow, Black-throated Green, and Hooded Warblers, Common Yellowthroat, Ovenbird, Eastern Towhee, Chipping Sparrow, Scarlet Tanager, Indigo Bunting, Eastern Meadowlark, Red-winged Blackbird, Common Grackle, Brown-headed Cowbird, and Orchard and Baltimore Orioles. Only a few birds are primarily winter residents, arriving in fall and staying until spring, including Yellow-bellied Sapsucker, Red-breasted Nuthatch, Winter Wren, Yellow-rumped Warbler, White-throated Sparrow, and Dark-eyed Junco. Spring and fall migrants not normally seen in summer and winter (except when lakes and rivers are unfrozen) include Tundra Swan, Wood Duck, American Black Duck, Bufflehead, Ring-necked Duck, Hooded Merganser, Common Loon, and Pied-billed Grebe. A few songbirds such as Hermit Thrush and Cape May and Blackpoll Warblers also pass through twice a year. This is a relict wetland complex supporting northern plants and animals at a southern latitude. The Nature Conservancy owns more than 300 acres in the Cranesville Swamp Nature Sanctuary. 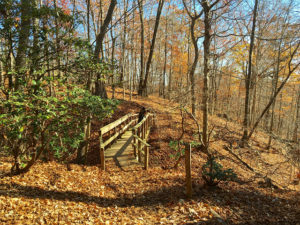 A boardwalk provides access to the mountain bog habitat and the area surrounding it is open to the sky. Bird life in the swamp is varied depending on the season and weather. High elevation species include Blue-headed Vireos, Black-throated Blue Warblers, Black-throated Green Warblers, American Redstarts, Northern Waterthrushes, Canada Warblers, and Dark-eyed Juncos. Other fairly common birds include Ruffed Grouse, Wild Turkey, Green Herons, Yellow-billed Cuckoos, Red-bellied woodpeckers, Downy Woodpeckers, Gray Catbirds, Swamp Sparrows, and Indigo Buntings. Be on the lookout for birds of prey including hawks, falcons and owls. Elevation: 2,460 – 2,620 ft. 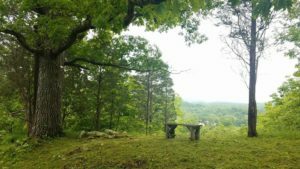 Situated in a mountain valley between Chestnut Ridge and Laurel Ridge on the western edge of the Allegheny Mountains, Upper Decker’s Creek provides a mix of marsh, ponds, fields and deciduous growth. This habitat provides feeding areas for shorebirds, raptors, migrating waterfowl and waders. The area boasts some of the best birding in the Northern Alleghenies. Some of the rarities that have been spotted here include Greater White-Fronted Geese, Snow Geese, Wilson’s Phalaropes, Pacific Black Brants, Caspian Terns, Forster’s Terns, Long-eared Owls, Short-eared Owls, Nelson’s Sharp-tailed Sparrow, Lapland Longspurs and Snow Buntings. On a good day, more than 100 species of birds are possible at Upper Decker’s Creek. Location: Off of Interstate 68. Bands of rock cliffs line the Cheat River Gorge and provide numerous overlooks. 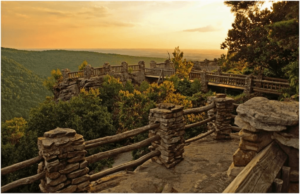 The centerpiece among these is the main overlook, which furnishes a panorama of the gorge and distant horizons. 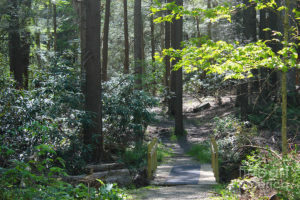 A maze of enormous boulders and cliffs fascinates hikers, and the trails are especially lovely in June when the rhododendron and mountain laurel are in bloom. Several trails wind through forest valleys and over ridges, and a number of creeks beckon the explorer. Glade Run is dammed to form a 6-acre pond that is regularly stocked with trout. The observant hiker can hear and sometimes see squirrels, chipmunks, hawks, owls, turkeys, turkey vulture, songbirds, fox and deer throughout the forest. More than 100 species of birds have been seen at Cooper’s Rock. It is prime breeding ground for songbirds such as Eastern Wood-Pewee, Acadian and Great Crested Flycatchers, Eastern Phoebe, Blue-headed and Red-eyed Vireos, Black-throated Blue, Black-throated Green, Cerulean and Hooded Warblers, American Redstart, Ovenbird, Louisiana Waterthrush, Common Yellowthroat, Scarlet Tanager, Rose-breasted Grosbeak, and Baltimore Oriole. 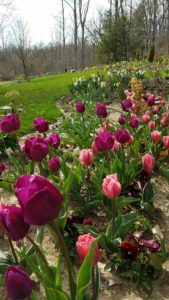 The 270-acre Mason Dixon Historical Park is jointly owned by Monongalia County, W.Va., and Greene County, Penn. With a wide variety of terrain and elevation, visitors are encouraged to pick up park brochures and trail maps at the park’s big red barn. Although the park is mostly wooded, a large meadow and wetland area around Dunkard Creek provide diverse habitat that attracts birds throughout the year. However, the warmer seasons bring great birding opportunities to this park. The meadow behind the barn is an ideal spot for American Kestrels, Barn Swallows, Eastern Bluebirds, and Eastern Meadowlarks. 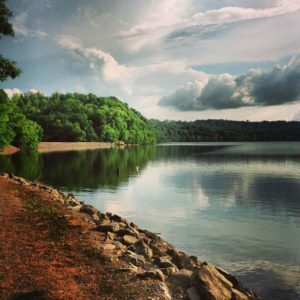 The south end of Cheat Lake is primarily of interest during spring, fall, and early winter waterbird migration. The best vantage points—all on the east side of the lake–are at Sunset Harbour Marina, directly under the east end of the I-68 bridge, and near the marinas south of I-68. Both Barn and Cliff Swallows nested under the bridge until its recent repainting. A former railroad right-of-way along the east bank of the river stretches from the Pennsylvania state line 29 miles south to Prickett’s Fort State Park north of Fairmont. 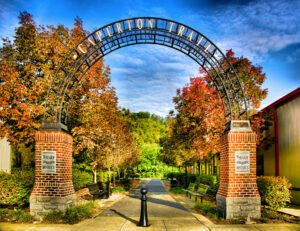 Several miles through downtown Morgantown are paved and called the Caperton Trail. The best areas are stretches north and south of the end of Van Voorhis Road, from Edith Barill Park in Star City south to the Morgantown Utility Board wastewater treatment plant; the stretch through the Core Arboretum, from Morgantown Lock and Dam north to the Route 19 bridge just north of Hazel Ruby McQuain Park; and north and south of the Uffington access area near the I-79 bridge. About 110 species have been seen between Van Voorhis Road and Uffington. During late fall and winter, the Dam-McQuain Park stretch may be the only unfrozen part of the river and is a concentration point for Canada Goose, American Black Duck, Mallard, Bufflehead, Common Goldeneye, Hooded Merganser, Pied-billed and Horned Grebes, American Coot, and Ring-billed Gull. Bald Eagle, Osprey, and Double-crested Cormorant are seen occasionally along the river at any time of year. This hidden gem is primarily composed of an old mostly-dried up reservoir fed by streams through a small shrubby marsh and heavily forested areas. 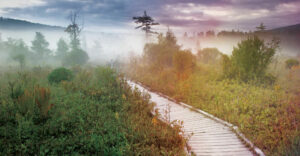 These are traversed by several miles of trails; the wetlands have a short boardwalk. 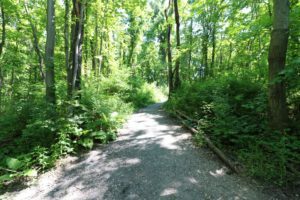 This 170-acre park on Morgantown’s south side, where about 65 species have been seen, contains five miles of trails in two separate sections of interest to birders. The section south of Mississippi Street west of the Morgantown Ice Arena contains a modest-sized reservoir where Canada Goose and Mallard breed; Great Blue and Green Herons and migrating Solitary Sandpiper have also been seen. 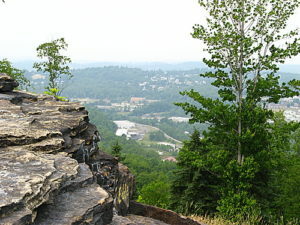 Located on one of the highest points in Morgantown, this 70-acre city park has several miles of hiking trails through mountaintop fields and woods, and there is a wonderful panoramic view of Morgantown and the Monongahela River Valley from atop the Sky Rock, its highest point. It is a popular stopover for migrating songbirds and many nest there as well.